My family grew like a weed since Kyler came. That’s because I also gained a nephew when I found out my sister was expecting a baby boy, Lincoln, just 6 weeks after me! I have to say, it’s one of the coolest experiences going through the "new mom" phase with your baby sister. By the way, do you ever really grow out of that phase? 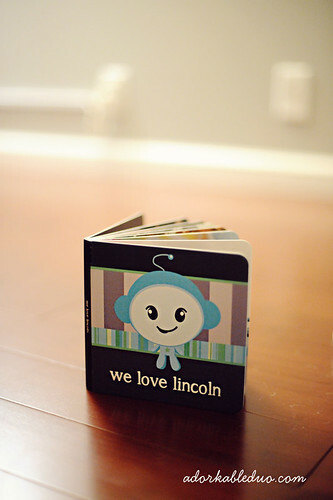 As a fun gift for Lincoln, I wanted to make him a board book of his family. It started with an intent to DIY, but that quickly went out the window while I was attempting to figure out the whole "mom" thing. So as any dedicated Gen Y-er would do, I googled and found Pint Size Productions. Not only could you purchase an existing design and personalize it, you can make a completely custom design, which was exactly what I needed. I made the template and pages in Photoshop, then used Bridge to generate the final print quality PDF. 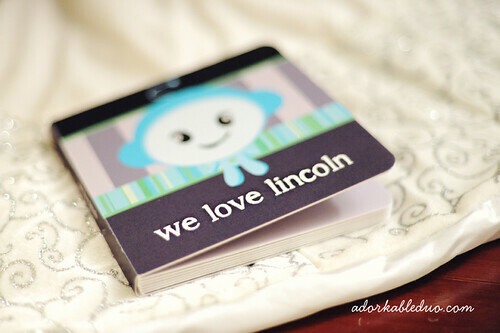 I didn’t even to attempt to write a story for Lincoln, so instead, I designed it as a "Who Loves Lincoln" theme. 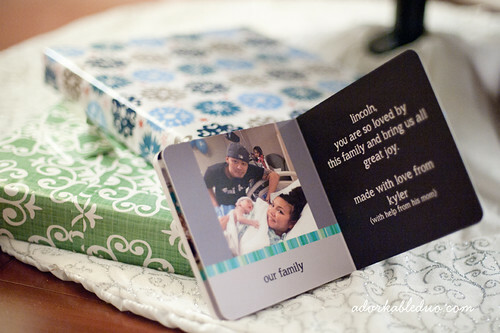 We aren’t all co-located in the same city, so this way, Lincoln would know who’s who in his family. 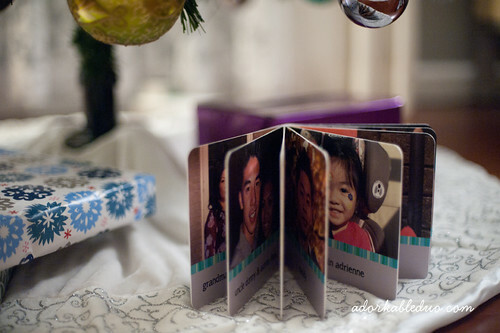 Each page has a picture of the individual (or couple in some cases – there were only 7 allowable page spreads), what their relationship to him is, and their names. Best idea ever, if you ask me. So no matter where Lincoln may be, he will always have his family with him. When I mistakenly sent in one too many spreads, someone from Pint Size Productions contacted me and I just resent a new file. I had actually sent an updated file after I hit ‘submit’ because I found an error and it was no problem for them to change for me. The customer service was seamless. They were fast and the quality of the book was great – like any other board book you can get in a Barnes & Noble or Toys ‘R Us these days. Their starting photoshop template included a Pint Size Productions logo for the spine, but I just removed it to keep the design completely custom and they still ran with it. Loved that. The last thing I wanted was to advertise on the side of the book. Pint Size Productions did not ask me to review their product. I paid for it and have just been a happy customer. That’s a great idea! I’m glad you were able to make a completely custom design for it 🙂 I think it looks great, and the design is really cute.